“Humanitarian” intervention would only deepen the humanitarian disaster. The reported use of chemical weapons by Syria’s Assad regime has not made much difference in that tormented country. Tens of thousands have been killed in the brutal fighting so far, and the violence continues with no end in sight. The chemical weapons allegations have, however, had a dramatic effect in the United States. Last August, the president warned that the use or movement of large quantities of such weapons would be a “game changer” with “enormous consequences,” marking a “red line” that must not be crossed. Ultimatums rarely make for artful diplomacy; in this case, it gave an opening to the neocon hawks. The same armchair warriors who relied on phony WMD claims to drive us into Iraq—William Kristol, Robert Kagan and others—started pounding the war drums again. They did so even amid uncertainty over nearly everything having to do with the chemical weapons reports: not simply whether they were used, but who—rebels or regime—may have used them. Neither the neocons nor the liberal interventionists seem aware of the deep divide in the Muslim and Arab world over this conflict, and they seem unconcerned that there is no legal justification for intervention. Apparently, it is enough that the United States is, as former Secretary of State Madeleine Albright once boasted, “the indispensable nation.” All that matters to the armchair warriors is Washington’s fragile “credibility,” which is apparently endangered whether a conflict involves an ally or an enemy, a near neighbor or a distant land. Perhaps recognizing the foolishness of declaring red lines, the president has recently displayed a sensible caution that others would do well to emulate (and that includes Israel, whose recent airstrikes have dangerously increased the chances of a regionwide conflagration). Given the terrible costs of the US wars in Iraq and Afghanistan, as well as the increasingly sectarian nature of the Syrian fratricide, Obama is surely right not to rush into another Middle East conflict. The lessons of those previous wars are particularly relevant. As Syria specialist Joshua Landis has argued, the country has many parallels to Iraq. 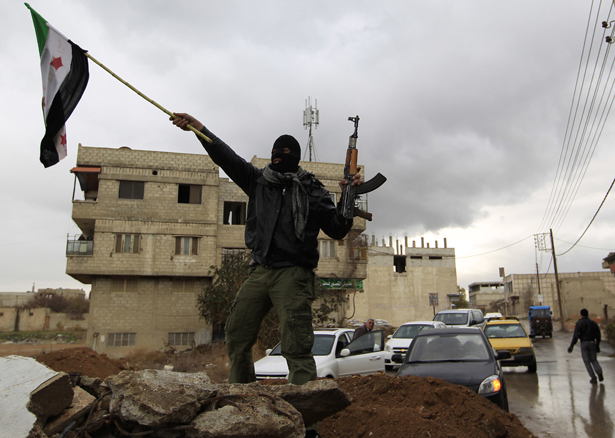 Like Iraq, Syria is rife with sectarian, ethnic and class divisions. As with the Iraqi Baath Party under Saddam Hussein, when a minority built around kinship and sect ruled over a Shiite majority, so in Syria a minority of Alawites, allied with other minorities, has ruled over a restive Sunni majority. The Syrian conflict has become more sectarian in part because of the influence of Turkey and the Sunni Gulf monarchies, bent on weakening Iran’s alliance with Assad. Despite Washington’s efforts to cobble together a united and more secular opposition, the rebels remain fragmented, with hardline Islamists—many of them openly avowing their allegiance to Al Qaeda—providing the fiercest and most effective fighters. The violence will continue if the regime falls; already chaos, criminality and warlordism beset the “liberated” areas. Even more ominous, the conflict is spreading. Lebanon’s formidable Hezbollah militia is now openly supporting the Assad regime, even as Lebanese Sunnis rally to the rebel flags. Like Turkey, Jordan is straining under a massive refugee burden, and its monarchy is despised by a deep-rooted Islamist opposition. Meanwhile, Iraq’s Al Qaeda affiliate, having solidified an alliance with its extremist Sunni brethren across the border in Syria, is girding for renewed rebellion against the increasingly oppressive and sectarian Shiite regime in Baghdad. So far, not even the neocons are arguing for a US invasion or occupation of Syria. But their call to supply the rebels with heavier weapons, with or without the cover of a no-fly zone, should be resisted. Syria is awash in arms, and there is no way to ensure that more sophisticated US weapons would not wind up in the hands of extremists. We should be sobered by our experience in Afghanistan, where Al Qaeda was born amid the mujahedeen we armed to fight the Soviet Union. To control the skies of Syria, the United States would have to attack radar installations, anti-aircraft sites and air bases in the face of Russian, Chinese and Iranian objections. Unlike in Libya, these targets are located not in the desert but in cities and suburbs, where the possibility of civilian casualties is far greater. Washington has no legal basis for waging war on Syria, direct or indirect. The Assad regime has not attacked, nor does it pose an imminent threat to, the United States. There is no UN resolution that can be stretched to provide even the flimsiest cover for armed intervention, as was done for Libya. Liberal interventionists suggest that the humanitarian tragedy provides justification for war, but that flies in the face of international law. Fortunately, the American people, tired of wasting lives and resources on misadventures abroad, oppose even arming the Syrian rebels. That mirrors public opinion among our European allies and in the Arab world, which has seen quite enough of the freedom delivered by American bombs and missiles. The horrors in Syria can’t be ignored, however. In fact, the United States can take useful actions. Obama should press Congress and the UN Security Council to increase humanitarian aid to the rapidly growing refugee population in neighboring countries as well as to those starving inside Syria. He should re-engage Russia and China—and, through them, Iran—to restrain Assad, while using Washington’s considerable influence with Turkey, Saudi Arabia and Qatar to restrain their military support for the rebels—especially for jihadi extremists. (The recent agreement between Russia and the United States to hold an international conference on Syria is a hopeful move in that direction.) And Obama should restrain Israel from provoking war with Hezbollah. It seems unlikely now, but Syria’s combatants will eventually grow weary of battle; as they do, Washington must work closely with regional powers to set up a power-sharing arrangement. The last thing Obama should do is commit the United States to overthrow the Assad regime. We could win that battle, as we did in Iraq—but, again, we would surely lose its violent aftermath. And we would be responsible for deepening the humanitarian disaster with our “humanitarian” intervention. Greg Mitchell blogs about disagreements between The New York Times and McClatchy on whether WMD are being used in Syria.